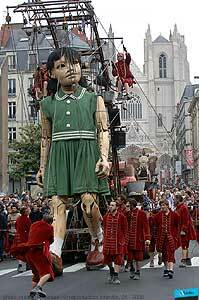 Oh, I'd love to see a Royal de Luxe show. They're these crazy French street performers who tend to construct very weird and elaborate machines and scenery for their spectacles. There was this exhibition last year in Toulouse, at the modern art museum, of a whole bunch of their old machines. You know, piano throwing machines, flame spewing monsters, etc. But I haven't seen a real show. 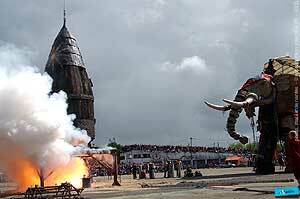 Recently they did a parade in Nantes, which involved a giant little girl, who arrived in a rocket, and there was a mechanical elefant, and various other wonders. Apparently it had something to do with celebrating Jules Verne. Here's a great commented gallery. You've captured this pecefrtly. Thanks for taking the time!